Whisk together dry ingredients (flour, salt, baking powder, baking soda, cayenne pepper) in a bowl. Whisk together sugar, vegetable oil, syrup , eggs, and vanilla extract in a separate bowl. Stir dry ingredients into wet ingredients. Then fold in zucchini and chocolate chips. Pour thick batter into a 9x5-inch loaf pan that has been lightly buttered and floured. Bake bread at 350°F for 70-75 minutes until a tester comes out clean. Let bread cool for 5 minutes in pan, then invert and carefully remove bread. Let cool for another 15-20 minutes before slicing. To store, wrap tightly in plastic wrap and store in the fridge for up to a week. Zucchini bread ... but better. I remember the first time I had zucchini bread. It actually made me want to eat all vegetables – I figured if you could make zucchini taste like that, then it’s possible to make any vegetable good. This spicy zucchini bread holds a special place in my heart though. 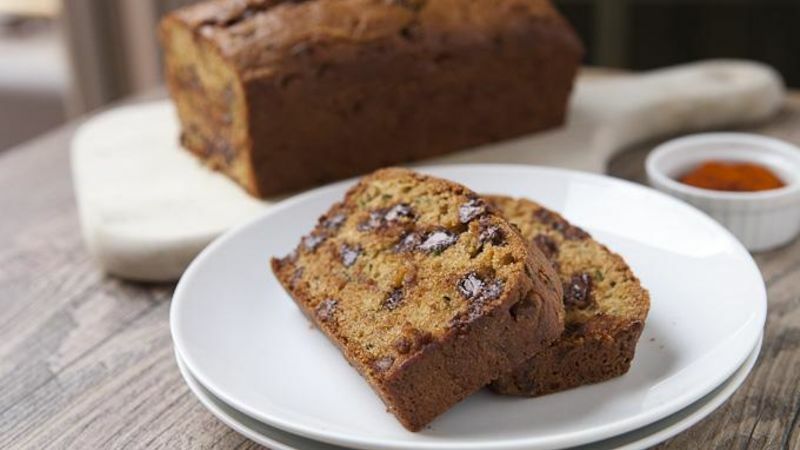 It’s rich and dense like a zucchini bread should be, but is also studded with wonderful chocolate chips. Then, out of nowhere, a fairly intense cayenne pepper spice kicks you in the mouth! Of course, the required ingredient for this bread is zucchini. You can go pretty heavy on it, and there isn’t a huge need to measure. You can eyeball it, but you’re shooting for around two cups of shredded veggies. The dry ingredients in this recipe are pretty standard, but there are some sneaky things in the wet stuff, like maple syrup. And a whole teaspoon of cayenne pepper. Yes. That’s a lot. Yes. You’ll taste it. Feel free to tone it down to half a teaspoon if you’re worried about your taste buds. Remember though, the richness of the bread will cut the spice a lot. Then just stir the wet ingredients into the dry ingredients and fold in the shredded zucchini. Do the same with the chocolate. It should be a really thick batter when all is said and done. Scoop the batter into a 9x5-inch loaf pan that has been lightly buttered and floured. Bake the loaf at 350ºF for 70-75 minutes. It’s so dense that it really does take that long to cook through. When the loaf comes out, let it cool for five minutes and then remove it from the loaf pan and let it cool for another 15 minutes before slicing and serving. It’s a really delicious loaf, but trust me – the cayenne totally makes it something special. Nick thinks this recipe is a sweet heat surprise! Check out his blog, Macheesmo, and follow him on his Tablespoon Profile.